Early fall is my favourite time of year. The weather is perfect and refreshing. I keep my windows open (which apparently freezes my friends), but also lets in all the fresh crispy air. A total relief after the crazy humidity we had this summer… especially since I was constantly cooking all summer long due to the food photography and recipe testing for my cookbook. (I’m nearing at the end p.s.) So excited!!! I seriously cannot wait until I get to share this book with you. 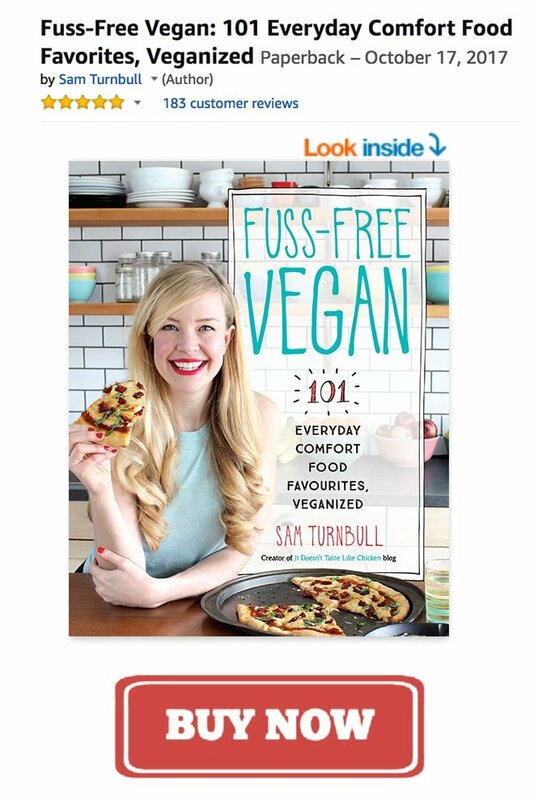 So many scrumptious recipes to be had! 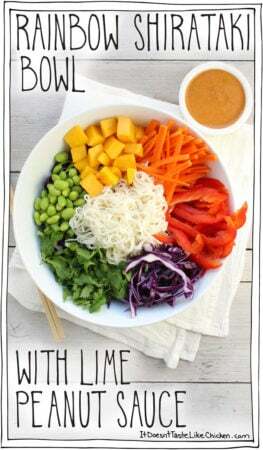 Isn’t this just the most vegan-y looking thing I’ve made in a while? A bowl of roasted veggies, kale, and brown rice… I admit it, as much as I’m all about vegan comfort food, even I sometimes like a good ol’ Buddha bowl. That said, it doesn’t mean that this bowl is in anyway boring. Just the opposite, this combo is a total flavour bomb. 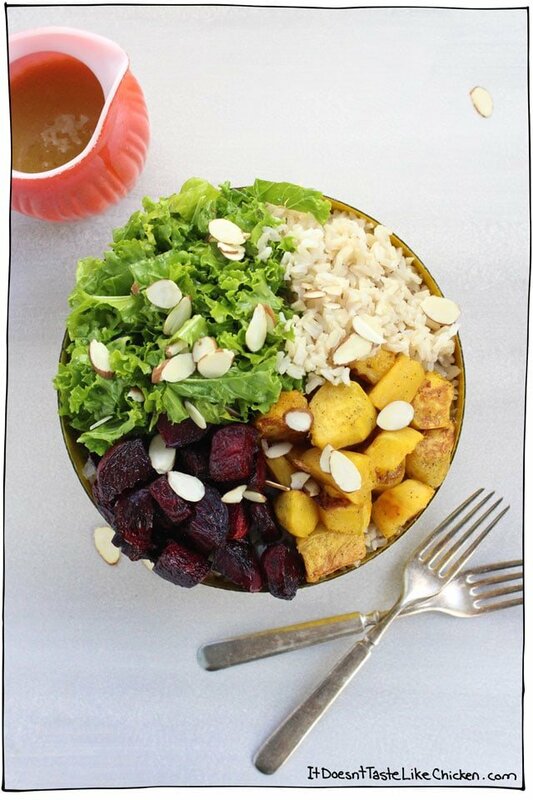 Sweet roasted beets, tender squash, and zesty kale on a bed of brown rice, all drizzled with maple mustard dressing. Yeah…. I was pretty excited to dig into this bowl right away! And don’t the colours just scream autumn? Loving it. 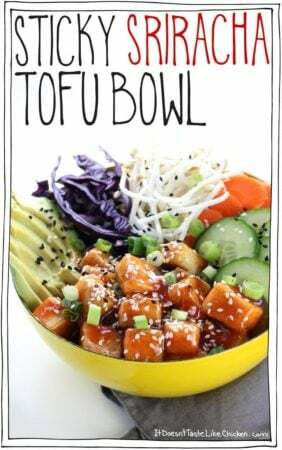 This bowl is super yum served warm, but it’s actually really good the next day enjoyed cold too. (She types as she is currently munching on it for breakfast). Perfect for a packable lunch for work, (if leftover breakfast ain’t your thing). To begin, peel and chop into chunks, the acorn squash and the beets. 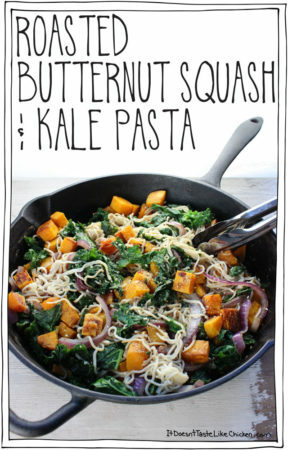 Other squash such as butternut would work well too. Put them into separate bowls so the beets don’t bleed onto the squash. Drizzle over the olive oil, salt, and pepper, and toss well to combine. Spread the acorn squash on a baking sheet, and the beets on another, and roast away until they are browned and fork tender. About 30 minutes, stopping to flip halfway through. In the meantime, de-stem and chop the kale. Add it to a large bowl and squeeze the lemon overtop. Now get in there with your hands to really massage the kale and spread the lemon juice. 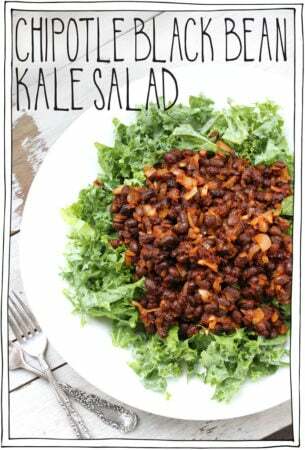 This helps the kale break down and become tender. Once massaged you can let it rest for up to 2 hours. The longer it rests, the more tender it will get. 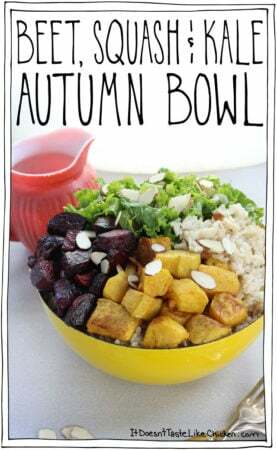 Assemble your bowls by adding some of each veggie, and the rice to a bowl. 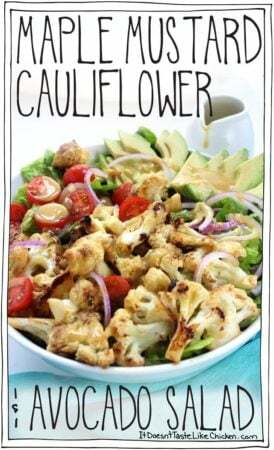 Sprinkle with sliced almonds, and then drizzle the maple mustard dressing to taste. 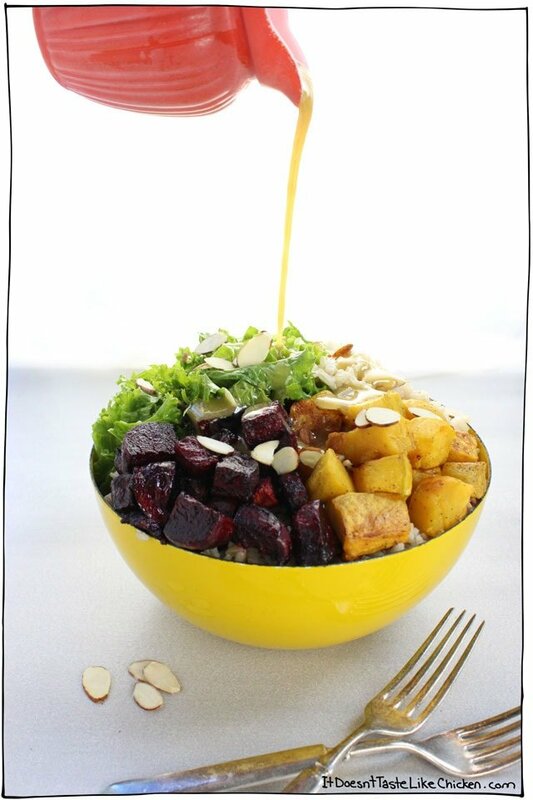 Sweet roasted beets, tender squash, and zesty kale on a bed of brown rice, all drizzled with maple mustard dressing. 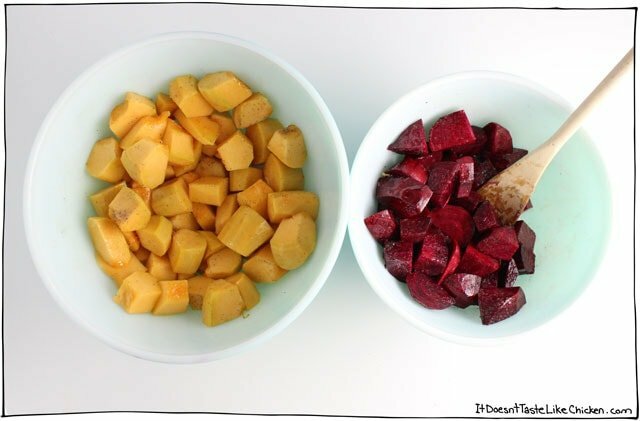 Add the beets ingredients to a bowl and toss to combine, then spread on a baking sheet. Add the squash ingredients to another bowl and toss to combine, and spread on a second baking sheet. (You want to keep the veggies separate or the beets will bleed onto the squash). Roast for 30 to 35 minutes until they are golden and fork tender, stopping halfway through to give them a stir. 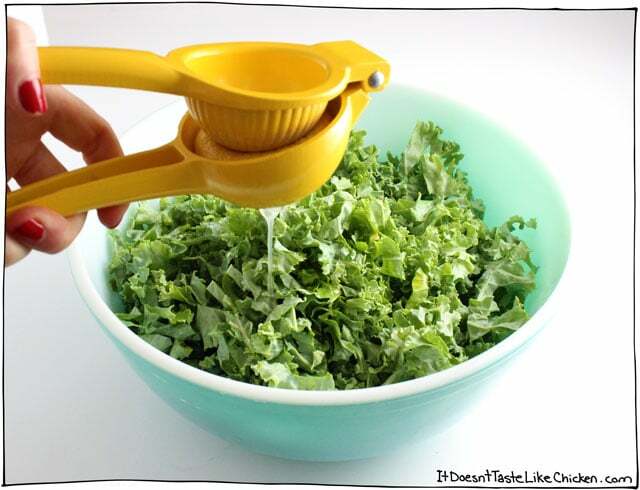 For the kale, add it to a bowl with them lemon, and then use your hands to massage the kale. This helps it break down and get tender. Set it aside for up to 2 hours. The longer it sits the more tender it will get. 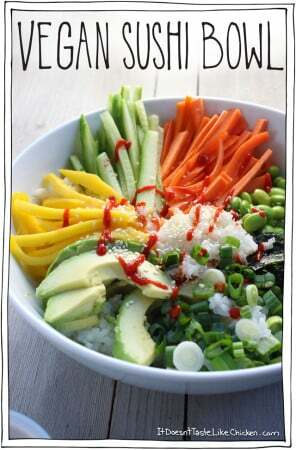 To assemble the bowls, add some of each veggie and some rice to a bowl. Drizzle with the maple mustard dressing to taste, and sprinkle some almond slices on top. Bon Appetegan!